This panel would be normally located where the landline telephone cable enters your house. The panel is roomy, and permits maintenance using common hand tools, except for a type of wire stripper (see Important Tool, below). The panel mounting holes are spaced at 16 inches for wall studs. This panel is only for use with household telephone cabling with or without ADSL, not for Ethernet network cabling, of course. I designed this after a day of helping a neighbor who was having telephone trouble (their line was noisy, incoming rings were very brief and calls could not be made or received). Reluctant to get into their old house cabling, I disconnected all their devices and connected a standard phone to one of their jacks; the problem continued. Following phone company procedures, I took the phone to their outdoor termination box, disconnected the house wiring, and connected the phone to the incoming line; the phone worked correctly. Down in their basement, I found that there were five cables connected by dangling 66 punchdown blocks. The house used a mixture of home-run cables and series connections. I cut off the punchdown blocks, and installed a screw-terminal jack box. Only the single home-run cable to the cordless base station was connected. Those phones now worked correctly. The rest was a matter of re-connecting lines one at a time until the problem returned, and it did with a series line of 4 jacks. I replaced two of their old lines and jack boxes with home-run 24AWG Cat3 cable, and just left their 3 unused lines disconnected. Lastly, I labelled the known lines at the junction jack box. In the end, finding the bad line would have been a lot easier if they had used home-run cabling without punch-down blocks, and if the cables had been labelled. Certainly, some punch-down connections can be re-punched, but I just feel that they're prone to intermittant connections and difficult to troubleshoot, especially in a basement environment. Important Tool: Stripping solid-conductor wire requires a tool that won't nick the conductor. Depending on the depth of a nick, damaged solid conductors will break when bent, and the break may be intermittant; troubleshooting a network with this kind of problem is a nightmare. If all the cabling was stripped improperly, every termination would need to be done over. I've seen builders using pen knives and box cutters on telephone cabling ... and even AC electrical cables. A good stripping tool for 30-20 gauge wire is the Hakko CSP-30-1 (inexpensive, available at Amazon). Cabling: These days, unshielded twisted-pair (UTP) Cat5 or Cat5e cables are used for landline telephone cabling. These are 4-pair cables, although (oddly more expensive) 2-pair cables are available. 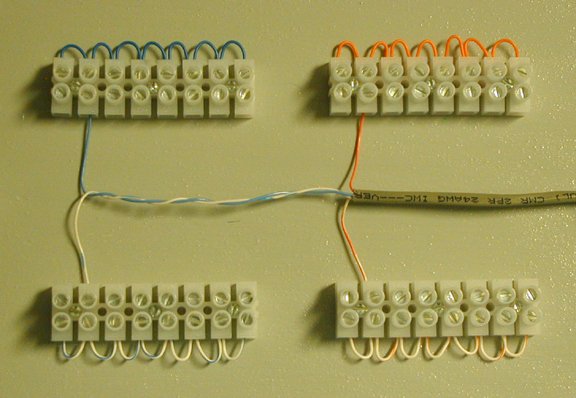 A typical home installation uses one pair for Line 1 and one pair for Line 2 (usually Blue and Orange pairs, although it doesn't matter which color pairs you use, as long as you're consistent). Even if you're only using Line 1, it's best to cable both lines in your phone network (the two unused pairs are wrapped around the cable body). 2-pair Cat3 cabling may also be used, but Cat3 cabling is generally obsolete. Telephone cabling, as well as Ethernet cabling, should be kept at least 2-feet away from AC power cables and fluorescent lights; it's OK to cross a power cable at 90 degrees, if necessary, but network cables should never run close alongside (parallel to) power cables. Try to avoid sharp 90-degree cable bends, as these will cause impedance changes. Rather, make a 90-degree bend of Cat5 cable with a circle diameter of 4 inches minimum. You may recall the basis of this precaution as Minimum Bend Ratio, and is of particular importance with fiber optic cables. When you use cable clamps, don't allow them to compress or distort the cable. It's best to use clamps or staples merely as loose or gently snug cable guides, and this applies to power cabling as well. A crushing clamp on an Ethernet or telephone cable will produce an impedance change (signal loss) which can only be detected with a time-domain reflectometry (TDR) cable tester. Excess cabling should not be coiled but should be routed to one side with a single U loop. For telephone jack boxes, you can use standard RJ-14 screw-terminal boxes with either 4 or 6-conductor jacks. If you'd like faster and easier assembly, modular RJ-14 punchdown boxes/jacks/covers are available at higher cost. You can also run a telephone and an Ethernet cable in a single box with separate RJ-14 and RJ-45 jacks. Don't even think about combining telephone and Ethernet in a single 4-pair cable: While this is physically possible, crosstalk will disrupt both telephone and Ethernet. Telephone and Ethernet must be run using two separate cables (and two jacket colors, if possible). It's also best to keep telephone and Ethernet cabling runs separated by at least 12 inches whenever possible. Final Thought: The overall load of a phone line is important. You may remember when Bell Telephone required the Ringer Equivalence Number (REN) of each device on your network, and the total could not exceed 5. One of the old-style phones typically had a REN of 1, and this meant that you could have no more than 5 of these phones connected. Don't be surprised if even a telephone technician hasn't heard of REN these days. [ I had a technician use an ohmmeter on a line without disconnecting all the devices, and incorrectly reported that the line had a short. ] You'll find the REN number on the back of every telephone device, even today; most new devices have a REN of less than 1. We're happy to have your input on our design, or any comments you may have for changes or improvements you might like to see. Thanks! Replacement Capacitor Listing for 22" Gateway Monitor LP2207 P/N FPD2275W - One of our four-year-old flat-panel monitors failed recently. The VGA and DVI inputs would display nothing, although the brief power-on display appeared normal. I thought I'd first have a look at its electrolytic capacitors before sending it to recycling. In the last 10 years, I've noticed that "electrolytics" seem to fail within 5 years either by opening or (more likely) shorting. Very often, these failing caps appear swollen, or slightly rounded, at their normally flat ends. These can fail if the applied DC voltage exceeds their rating, or if the cap is constructed of poor-quality materials. To avoid early failures in these inexpensive components, I try to use caps manufactured in the US or Japan, and never use caps as they are currently manufactured from China. Long story short, the capacitor replacement restored the monitor. I had noticed 4 swollen capacitors among the 3 circuit boards, but decided to replace all 32 electrolytic capacitors in the Gateway. Since there is plenty of room on the Gateway boards, installing caps with higher voltage ratings does not pose a problem. Two of the caps on the power board have removable sealant applied (perhaps these have a vibration noise sensitivity?) and you can seal the new ones to the board using hot glue or similar. Be aware that failed caps are only one possible cause of your monitor's failure; other board components and the LCD panel itself can also be defective, so you shouldn't expect capacitor replacement to be a cure-all. The level of difficulty or expertise required for this cap replacement is moderate, and we only recommend it for technicians with experience in static protection and through-hole component replacement. The entire operation will take about 10-12 hours, and this is why we do not offer this service; it would not be cost-effective versus monitor replacement. Nevertheless, I might be able to save you the day it took me to inventory and single-source the replacement capacitors. All I ask is $15.00 made at PayPal to "helpdesk@evergreenpcs.com", and I'll email an Excel spreadsheet to you with US ordering website, part numbers and quantities for all the caps. It should take you about 20 minutes to complete the online order. These caps will cost about $8.00, and UPS shipping is about $7.00. Disassembling the Gateway monitor is not the easiest job in the world, but it's not too bad. You should use something like numbered muffin tins to organize the screws. Once you've removed the stand and rear screws, you then put the monitor on its back and pry up the front bezel (although you'd think that the rear cover would come off next, but not so). You might try using a putty knife to remove the bezel, starting at a bottom corner. Be careful of the flat cable connected to the front bezel ... there is a connector with a "flip-up" clamp on the bezel. Next, you'll pry off the rear cover. It's a good idea to make rough drawings of the 3 boards and their cable orientations. When re-installing the front bezel, be careful not to "guillotine" the small flat cable with the bezel sides. Among the shortcomings of this stairlift (no longer sold in the United States) are the seat/footrest springs (they break) and, of more importance, the four rollers that support the stairlift on the travel rail. Other than those components, the stairlift is well made and reliable. Short of finding and replacing the springs, the seat can be held in the raised position with a strap around the backrest, and the footrest can be held with a velcro strap. The four rollers that support the stairlift use plastic bushings instead of sealed bearings, and these require periodic lubrication. We've tried using molybdenum grease, but it has a very short life (moly grease is useful for the gear rack, however). There are a couple of horizontal guide rollers that should also be lubricated. A better solution seems to be Supco's ZoomSpout MO-98 oil, which is surprisingly long lasting. While it's not easy, the rollers can be lubricated from underneath with the stairlift in place and using a flashlight. When you do this, you should also clean the rail channels where the rollers travel. Certainly, cleaning the rollers themselves would require removal of the stairlift from the top of the rail, which I avoid if at all possible. I looked into the possibility of replacing the rollers with overmolded bearings. One manufacturer, JESA, has developed a bearing specifically for stairlifts which is overmolded with a glass fibre-reinforced polymer. Unfortunately, their Europe-only distributors do not make small quantities (fewer than 10,000 or so) available. [ Note that the ID of 13mm may or may not fit firmly on the 13Wx12L (mm) shaft; you should test the fit with any ID 13mm bearing first before ordering a set. ] Note also that the roller channel has a height of 31mm and width of 13.5mm, and there must be a small clearance (0.5mm) between the bearing OD and channel height. There are some other (neoprene, nylon, etc.) overmolded bearings which may be more easily obtainable, but we don't know if these would be satisfactory for load and wear. As with most sealed bearings, these are pre-lubricated and should never be oiled.